She was born in June 2013. April is a small, friendly, gentle, white and black, female. 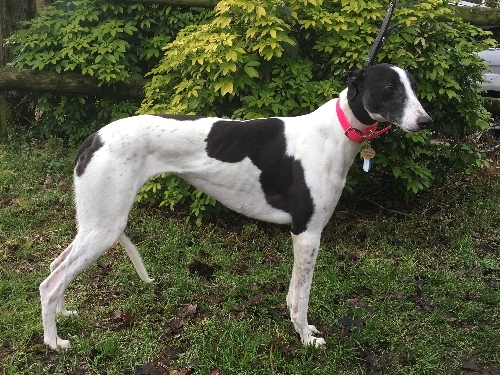 She enjoys her walks and will stand nicely while you put her lead on, she walks nicely next to you on, enjoying all that she sees. 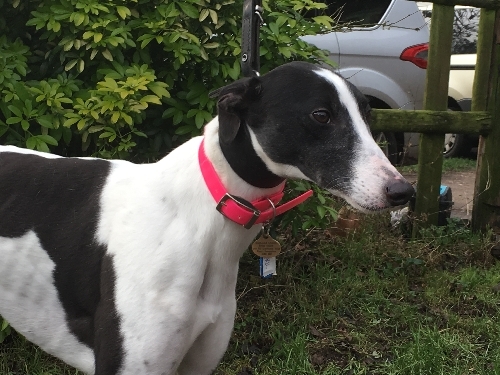 April is currently not interested in toys and would prefer to have cuddles from a familiar person and gives gentle kisses too. She is very gentle taking treats for you and waits patiently for her food at meal times. She enjoys her outings in the car and will settle down quickly ready for the off. Being young April would be best suited as a companion to another dog and, or to a family where somebody was around for most of the day. She would be able to live with children. 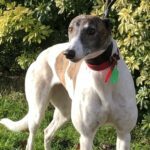 April has been tested with other dogs and is very happy to be around them once initial introductions have been carried out. She has not been cat tested yet. April was a new arrival as of 21/1/16 as we get to know her better more information will be made available. 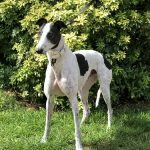 This entry was posted in Greyhounds Homed and tagged Featured, Gentle, Happy, Homed, white and black by Lucy.